As landscape painters, one of our main tasks in composing is to get our viewers into the painting and gracefully out of it. The creation of entrances and exits requires that the viewer move easily and at the appropriate speed through the painting as well. No easy task! 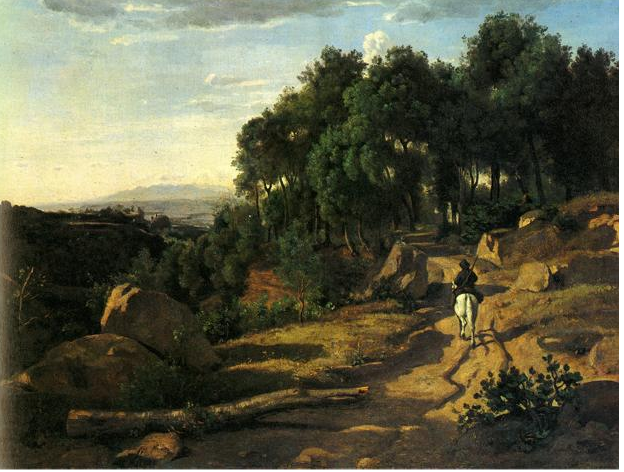 Here the great French painter Camille Corot has used that little hill on the right bottom of the picture plane on which to perch his viewer. The shadowed foreground gets us into the painting and the lit up area surrounding the horse and rider form a natural focal point. The road pulls us up into the trees, and then the trees move our eye over to the distant trees and hills and sky. Look at the painting and squint and you will see how carefully and masterfully Corot has designed the light and dark areas. This is the use of value as abstract pattern which serves the design well. PS Our upcoming online class Composing the Landscape (starts October 31). This class covers the fundamentals of landscape composition and gives tried and true strategies for both learning about and creating compositions that work. All the great color in the world won’t save a bad design! 🙂 Join us! Very nice analysis, thanks. You’re right, squinting reveals a whole hidden dimension in the painting. I love the flow there.